It all started in 1987 when JoAnna and I fell in love and started our life together. She had always wanted kids, and brought the subject up early in our relationship. At that time having a child was far from my mind. 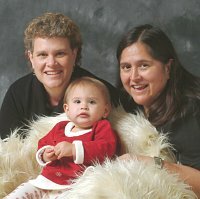 I was twenty-three, still in college and just starting to discover myself and the world around me, and besides I had never met a gay couple with a baby. The thought of having a baby to care for scared me to death, so when the subject would come up, I would tell her I wasn’t quite ready yet. This went on for years, until one day in the early summer of 2002, something just clicked, call it my biological clock, whatever, but I decided I too wanted a child more then ever. I felt settled, we had a nice home in a family neighborhood, and decent paying jobs…there was no better time. And so our baby journey began. We decided because of the current political climate and how gay parents are viewed in our society, we wanted one of us to actually carry and have the baby. Our logic was that if one of us was the biological parent our child could not be taken away. We came to the conclusion that I, being younger, would carry the baby. At the time, a co-worker of JoAnna’s and her partner had a baby through an IUI from the sperm of an anonymous donor purchased through a local cryobank. We both felt this would be the best way for us also, we could both be parents without the concern of a third party. Our donor search started through the Internet, we sought a Hispanic male, to match JoAnna’s ethnicity, with a good family health record. After much searching and consideration, we found one and decided to start trying with my OBGYN. For some reason, I just figured I would become pregnant on my first try; after all I do come from a very fertile family. Well, we tried four times and achieved no positive results. Very disappointed, I was referred to a reproductive endocrinologist for further evaluation. After a consultation and a HSG test, to make sure my tubes were clear, we started doing IUI’s with Clomid. I became pregnant after the second cycle, but sadly ended up losing it at about 6 weeks. Determined, we tried once more and became pregnant, but again excitement led to sorrow when I miscarried at 8 weeks. All sorts of tests followed to see if there was a reason why I had miscarried twice, but nothing abnormal was found. We decided to keep trying, and on the second IUI after the miscarriages, I again became pregnant. I was very guarded throughout my entire pregnancy…but this time everything was different, and nine months later we had a healthy baby girl. Having a child has changed our lives completely; she is the best thing that has ever happened to us. It has added a whole new dimension and purpose to our lives. We are truly blessed. We decided because of the current political climate and how gay parents are viewed in our society, we wanted one of us to actually carry and have the baby. Our logic was that if one of us was the biological parent our child could not be taken away.